500 + regional artists create ART on 8″x8″ wood panels. 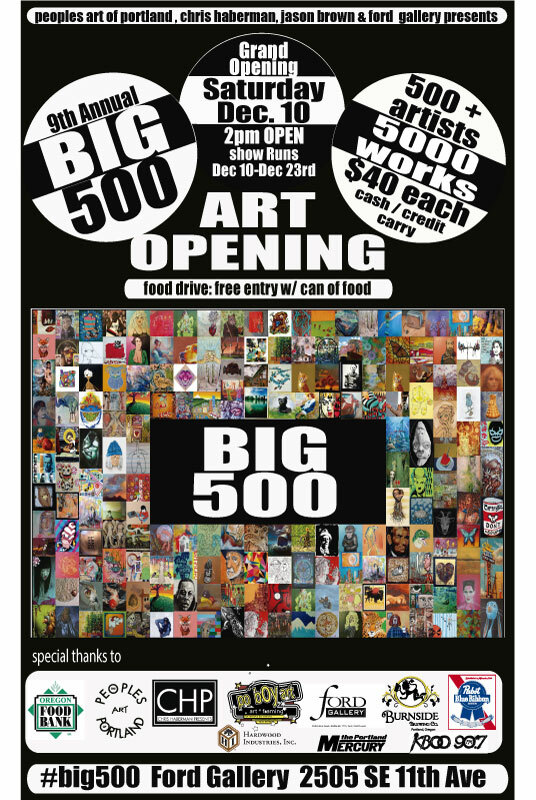 5000 + works of ART on display, a mere $40/piece!!!!! CASH/CREDIT/CARRY. Event begins SHARP at 2pm, Saturday, December 10, 2016. First Come/First Serve. NO ART will be SOLD before 2pm this day. Show runs through December 23, at Ford Gallery, the main floor of the Ford Building/SE Division. Gallery hours Dec 11-23, 9am-6pm DAILY. A portion of the proceeds benefits the Oregon Food Bank. FREE entry with non-perishable food items/Can Food. Proudly, this is our 9th year for this show, which has moved to this location from its high rise galleries at Pioneer Place (2009-2015).